Other than warm, fresh chocolate chip cookies, very little can top warm, fresh, homemade rolls. 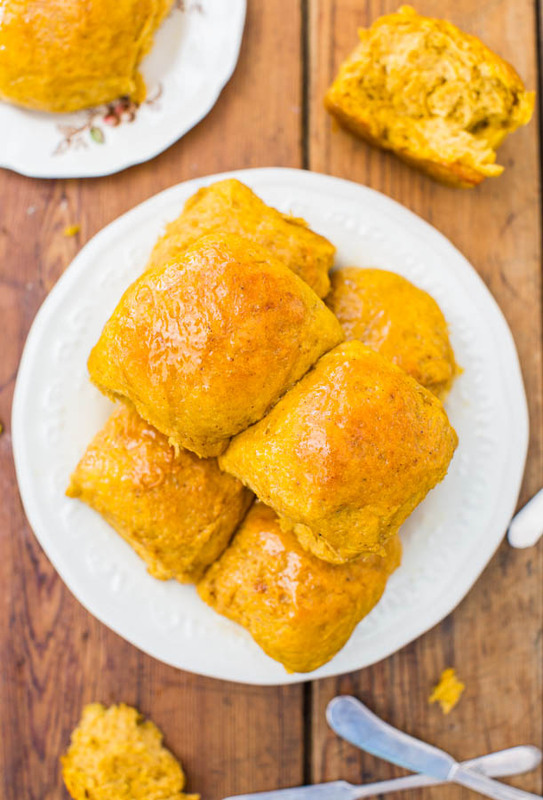 And rolls made with pumpkin and honey butter are even better. The rolls are easy to make and are ready from start to finish in under 2 hours. Not bad at all for a yeast recipe. 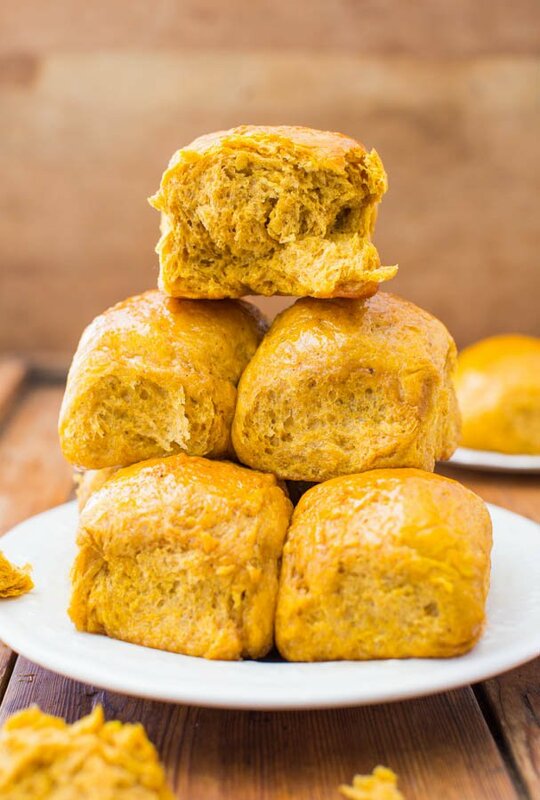 They’re soft, slightly chewy, and the pumpkin keeps them moist and adds just enough tooth-sinking density. The scents of pumpkin, spices, honey, and bread baking that waft thorough the house are positively intoxicating. Sure beats lighting a pumpkin-scented candle. 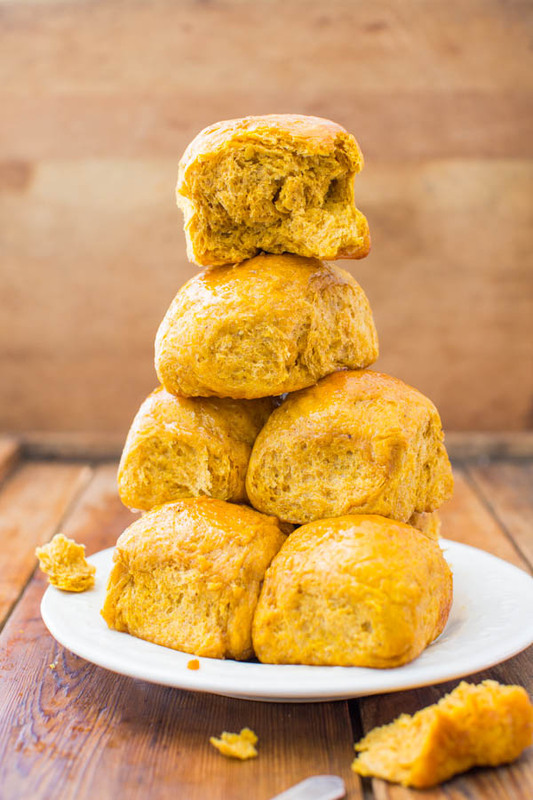 I purposely designed this recipe for singles, smaller families, or for the average weeknight dinner when you don’t need dozens and dozens of rolls. I cringe when I see 4 to 7 cup of flour recipes. This has just over 2 cups and serves a family, not an army. Any extras freeze nicely. Not that I think you’ll have any. I’m sure you can double the recipe if you need more, although I haven’t tried. The entire batch fits on the plates shown below. Normally I don’t do step-by-step photos because frankly, they’re a pain. Stop, start, wash hands, pick up camera. Do the next step, get dirty, wash hands, pick up camera; repeat. Then edit all the photos. But I was feeling generous and I want the photos to convince you these rolls are do-able, even if you’ve never worked with yeast. 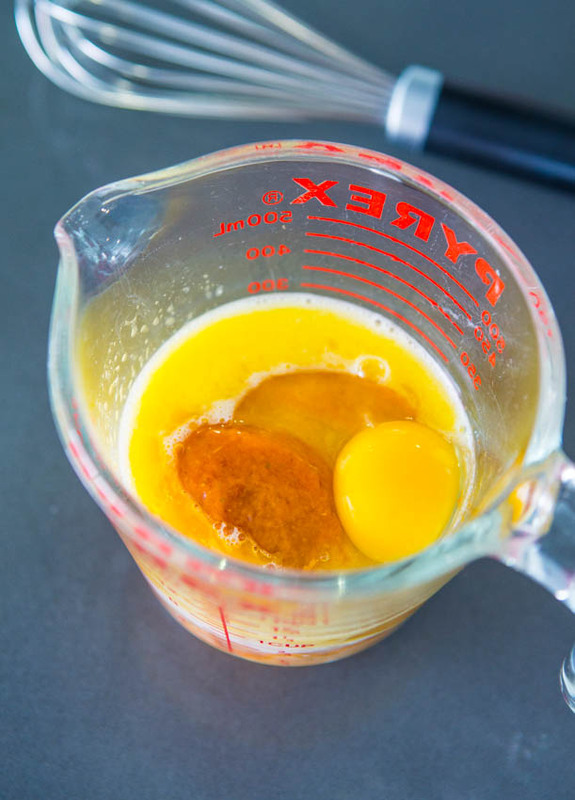 Add milk and 2 tablespoons of butter to a measuring cup. Zap it for about 45 seconds in the micro and stir until the butter melts. 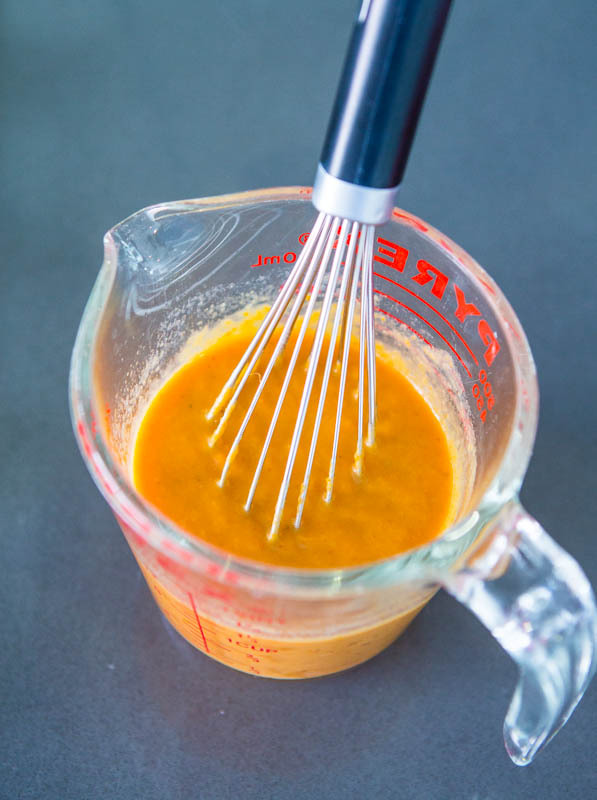 Top it off with pumpkin puree, 1 egg, and whisk together. In muffin making, this would be the wet ingredients that you’d pour over the dry. Same concept here. Heat it for another 15 seconds, just to get it nice and toasty. This doesn’t make the mixture hot, but ensures the mixture is warm enough to activate the yeast. This is a rare yeast recipe that I never even took out my thermometer. In general with yeast and liquid, if it’s ever too hot that you can’t comfortably stick your finger in it, wait a minute or two until you can or you’ll kill the yeast. Get out your flour and yeast. I only bake with King Arthur All-Purpose and sometimes King Arthur Bread Flour. 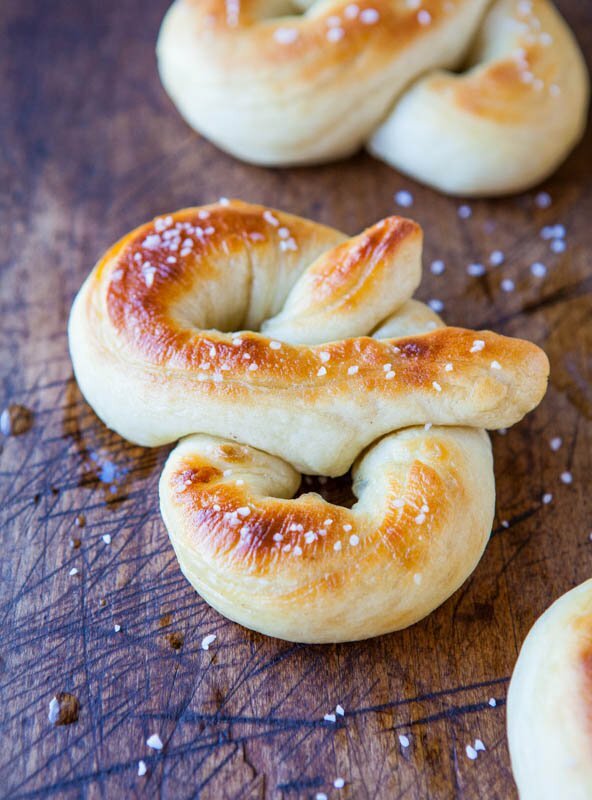 Bread flour will lend a chewier, thicker, denser result, more like a bagel. I wanted to keep these rolls softer and fluffier and opted for all-purpose. I strongly recommend KA flour because the protein levels are generally slightly higher than in other brands. In baking, this lends more structure, translating to puffier cookies, stronger cakes, and better rising bread. Cheap flour is cheap flour. Spend an extra two bucks for good flour. The results are worth it. I only bake with Red Star Platinum Yeast. It’s the best yeast I’ve ever tried and it never lets me down. If you’re new to bread-making or working with yeast, consider this yeast your insurance against goofs because it’s very forgiving. Since it’s an instant yeast, you don’t have to proof it (let it stand with warm liquids for 10 minutes or until foamy). You simply add it with the rest of your dry ingredients. 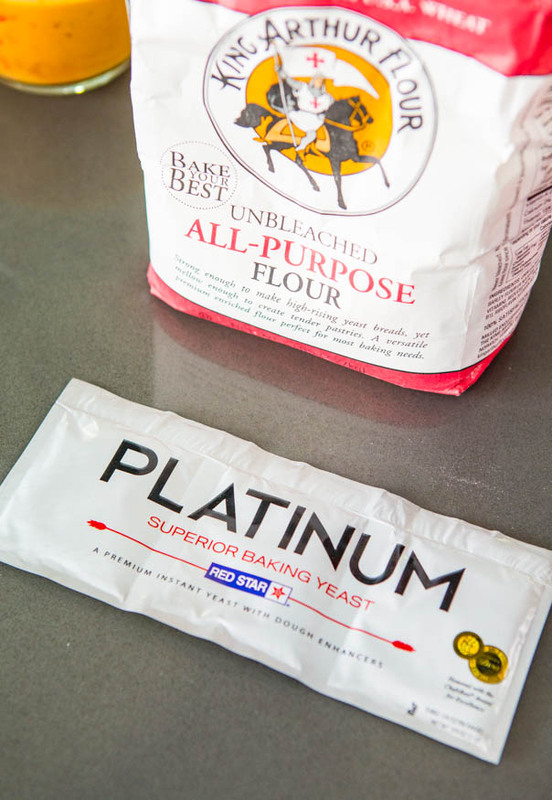 If you are an experienced bread maker, you’re going to love the extra puff and oven-spring you get with the Platinum. Your baked goods will rise higher and faster than you’re used to. So well worth the extra buck compared to other yeasts. 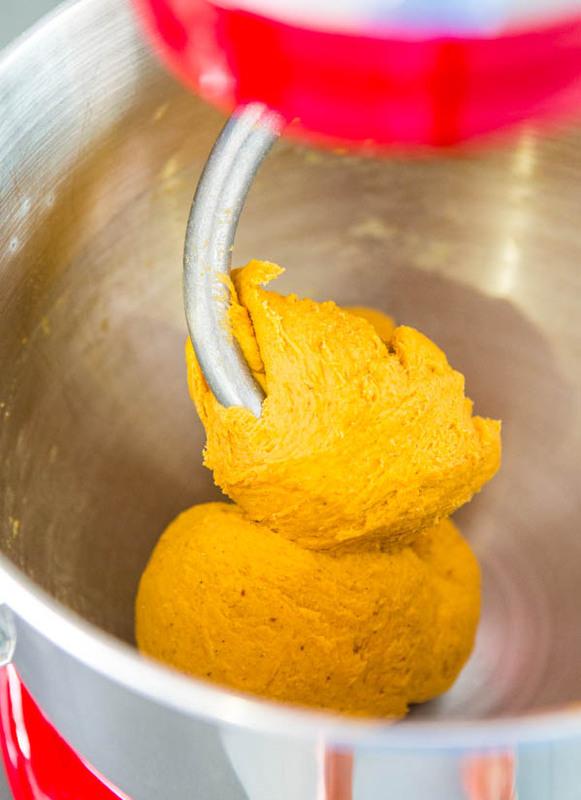 In a mixing bowl, add the flour, yeast, 1 tablespoon sugar (must-have, it’s the yeast’s food source), 1 tablespoon pumpkin pie spice, and 1 teaspoon nutmeg. Sounds like a lot of spices, but it’s not. 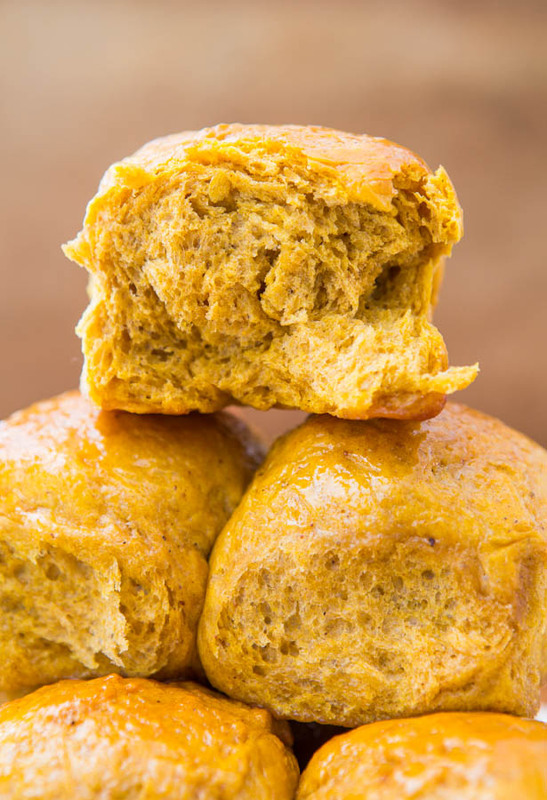 Pumpkin puree and flour are both insanely bland and need to be jazzed up with spices. I did not add salt because I am very sodium-sensitive but if you’d like to add a pinch, feel free. Knead the dough for 5 to 8 minutes. I used my stand mixer, but you can do it by hand. You really want to develop the gluten. 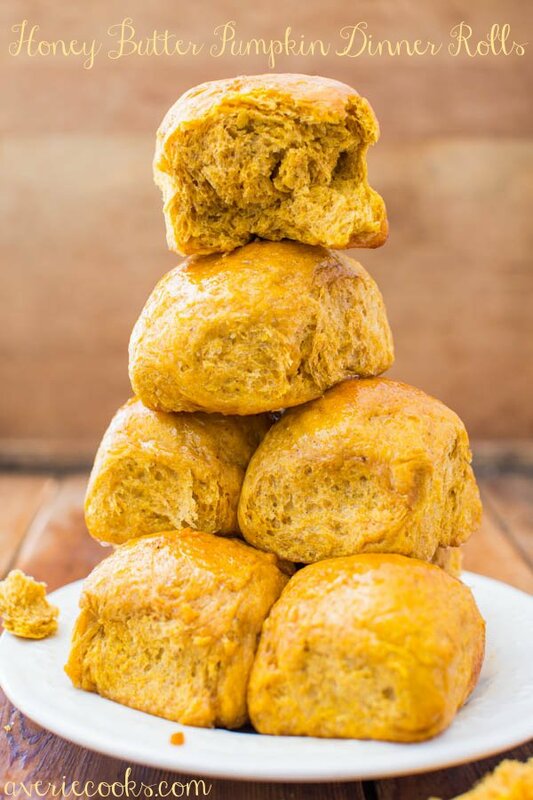 Pumpkin is dense and heavy and will weigh down the dough and by kneading it thoroughly, you create gluten formation, which helps the bread rise better and not stay dense. I could have gotten away with 2 cups flour, but I used 2 1/4 cups. Over-flouring the dough is a no-no because it creates dense, thick bread that’s not light and fluffy. But for the sake of knowing that without a doubt this recipe will work in other climates, I went up to 2 1/4 cups. You can see this dough is not sticky or gloppy at all. It’s a dream dough to work with. Nice and smooth. Put it in a bowl, cover with plasticwrap, and place in a warm, draft-free place until it nearly doubles in size. For me, this is the inside of my oven (powered off) and took 45 minutes. Do not go by the clock. Go by how your dough looks. If it takes longer, it means your house is cold or the yeast is just being pokey. That’s life. Wait until your dough has nearly doubled before moving on. 45 minutes later, we’ve doubled in size. Look at that big puffball. When I punched it down, it sounded like air being let out of a helium balloon. I love that sound. Means the yeast worked and the dough is alive. Shape it into rolls. I made 8. I could have made 9 or 1o because 8 made very hearty-sized rolls. My husband wasn’t complaining though. Put them in a pan and wait until they’ve nearly doubled in size, likely about 30 to 45 minutes. Before baking, brush them with equal parts melted butter and honey. Whatever is left over, reserve to brush on after baking. They’re little sponges and will happily absorb it. 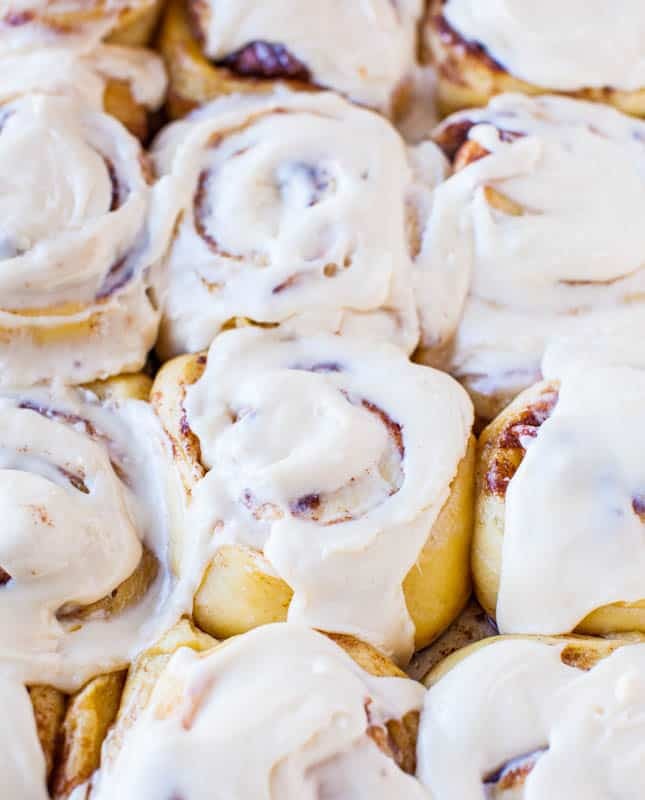 Look at these big, golden, glistening buns. They’re soft, fluffy, and just chewy enough. The pumpkin flavor, while present, is not overly strong. 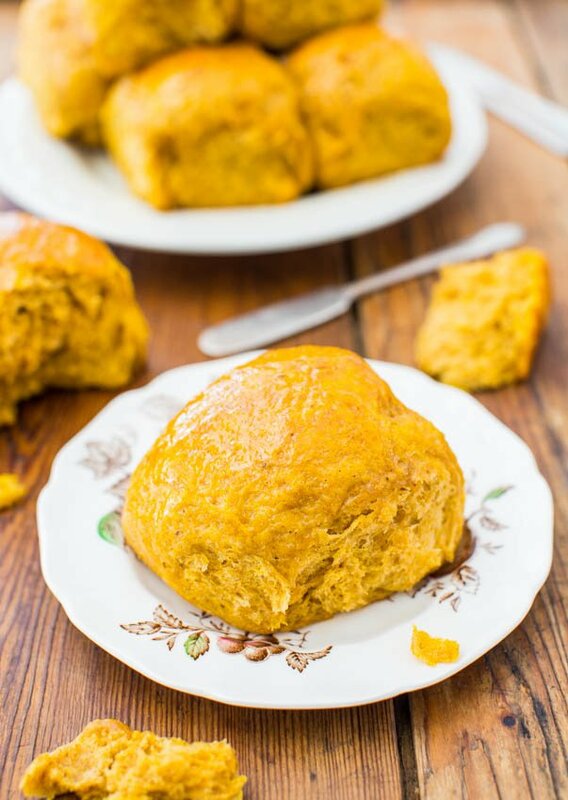 If you know someone who’s on the fence about pumpkin or have a family where some people love it, but others are just so-so, these are the perfect compromise. They give the pumpkin lovers a taste of their favorite orange-colored food group, while not alienating those who don’t love in-your-face pumpkin flavor. 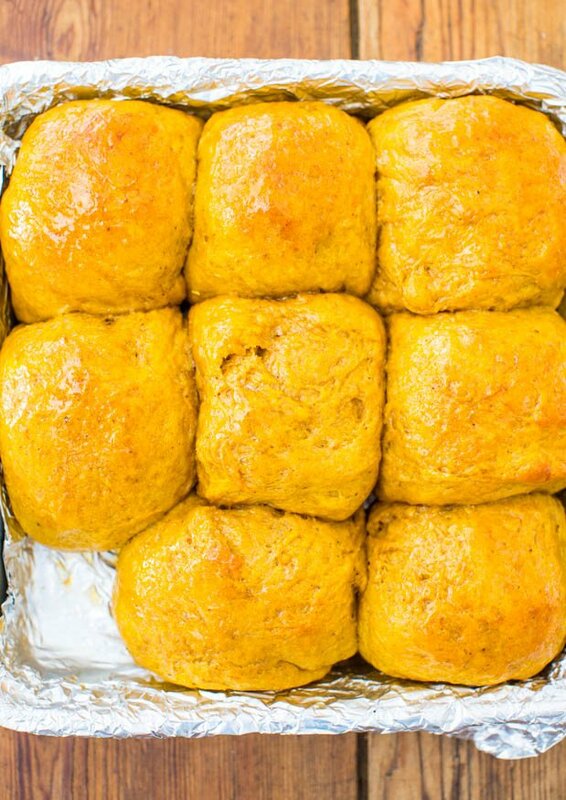 I’d like to call them ‘Honey Butter Gently-Flavored-With-Pumpkin Dinner Rolls’. In the recipe section, I built in a make-ahead/overnight option. However, they’re so fast to make, I don’t know if you’ll need the make-ahead option, but it can save an hour on baking day. I haven’t tried freezing unbaked dough, but most baked bread freezes beautifully. I hope the recipe comes in handy for your fall baking, Thanksgiving dinner table, and holiday parties. Or for dinner rolls any old night of the week just because. 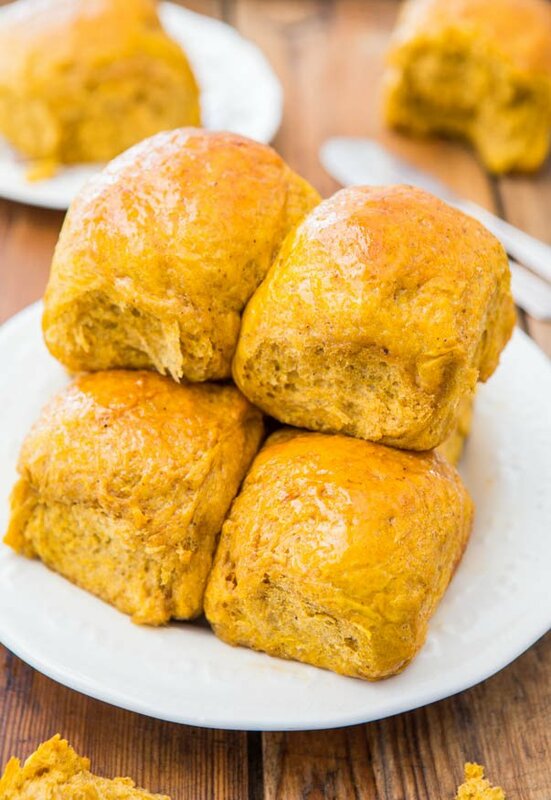 It’s my new go-to pumpkin dinner roll recipe after playing around with many others over the years. Enjoy. 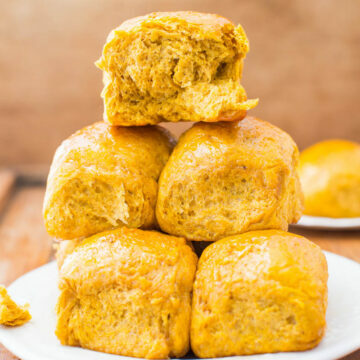 These rolls are soft, slightly chewy, and the pumpkin puree keeps them moist and adds just enough tooth-sinking density. The pumpkin flavor is present, but not overly so, making them a perfect choice for those who may not love bold pumpkin flavors. 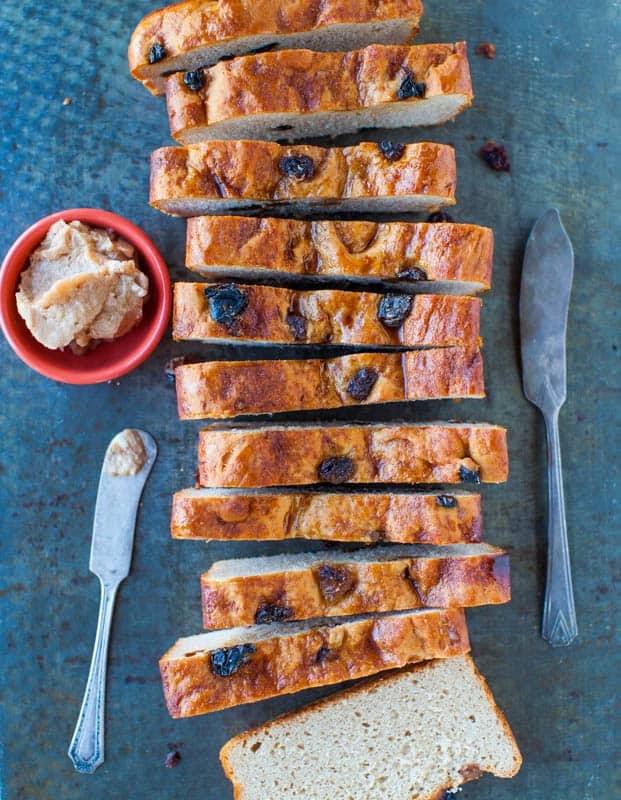 The honey-butter adds sweetness and helps keep them soft and moist. They’re a fairly fast yeast recipe to make because the dough rises like a champ, and they’re ready from start to finish in under 2 hours. It’s a smooth, easy dough to work with and not at all sticky. 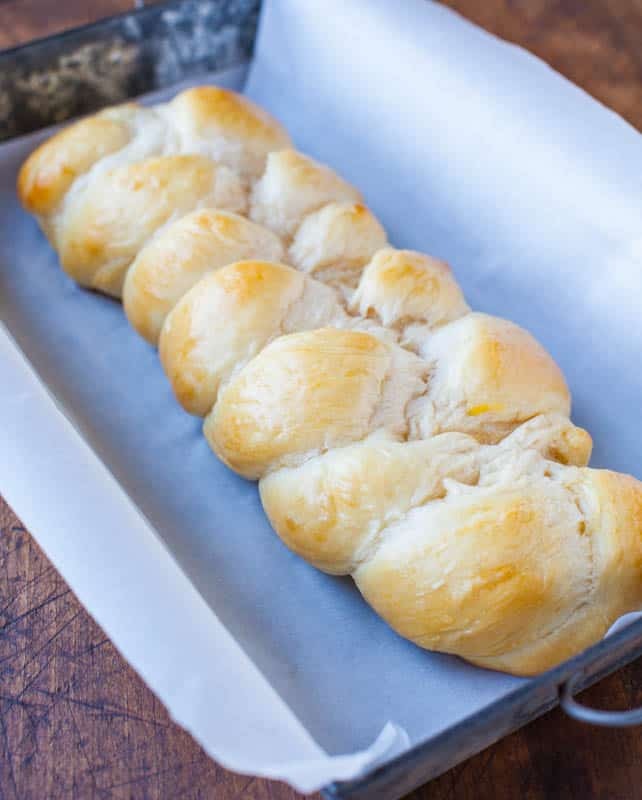 The recipe makes a modest batch of rolls, nice for singles or small families and extras freeze beautifully.They’re great for week nights when you want fresh dinner rolls, but don’t need dozens. I’ve built in a make ahead option, see step 12. Enjoy them at your next fall holiday gathering. 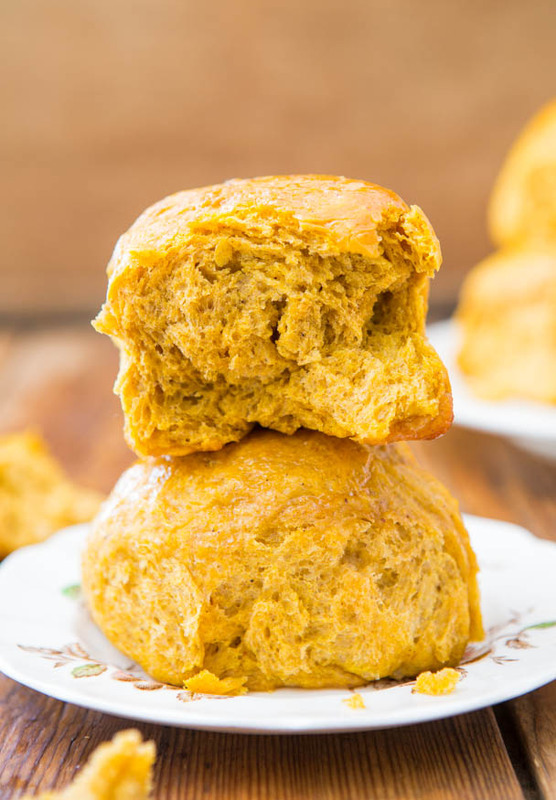 It’s my new go-to pumpkin dinner roll recipe after trying many over the years. Dough – Add milk to a 2-cup microwave-safe measuring cup, or microwave-safe bowl. Add butter and heat on high power to melt butter, about 45 seconds. Stir until butter has melted smoothly into the milk. Return measuring cup to microwave and heat for about 15 seconds to warm mixture up. This will help to activate the yeast; set aside briefly. 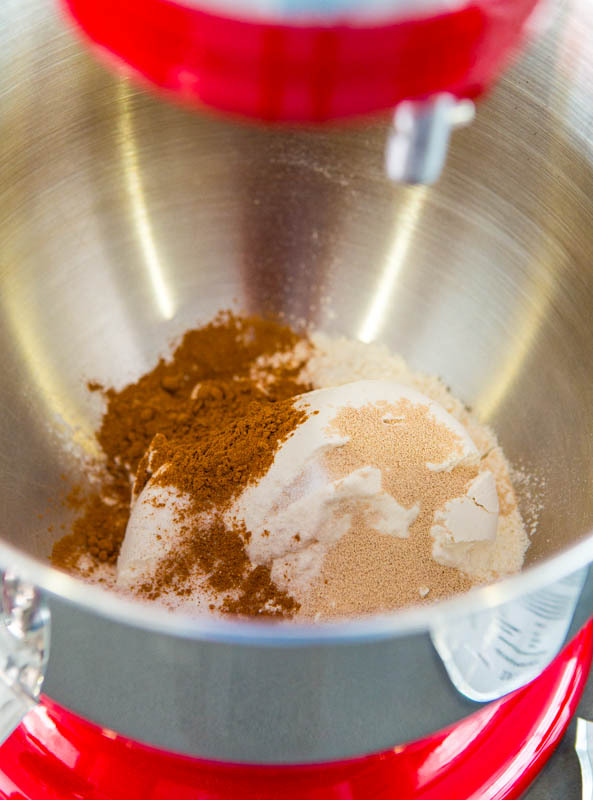 To the bowl of a stand mixer fitted with the dough hook or large mixing bowl for hand kneading, add the remaining dough ingredients, thorough optional salt. Turn mixer to low speed, and knead for 5 to 8 minutes, or until dough is smooth and has come together. This is not a sticky dough and if your dough is sticky, tacky, or gloppy, add additional flour, 1 tablespoon at a time, until dough is no longer sticky. I doubt you will need to add any, because I could have made this recipe with 2 cups flour, but went up to 2 1/4. Don’t over-flour your dough because it creates rolls that are dense and heavy. 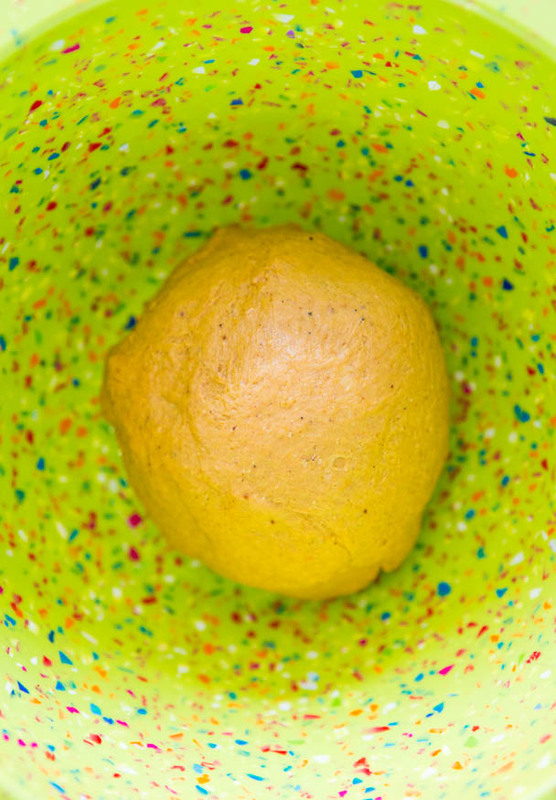 Turn dough out into a mixing bowl that’s been lightly sprayed with cooking spray. Flip dough over once so both sides are lightly greased, and cover bowl with plasticwrap. Place bowl in a warm, draft-free environment until dough has nearly doubled in bulk, about 45 to 60 minutes. Do not go by time elapsed on the clock. Wait until dough has nearly doubled in size, and if it takes longer than an hour, that’s fine. 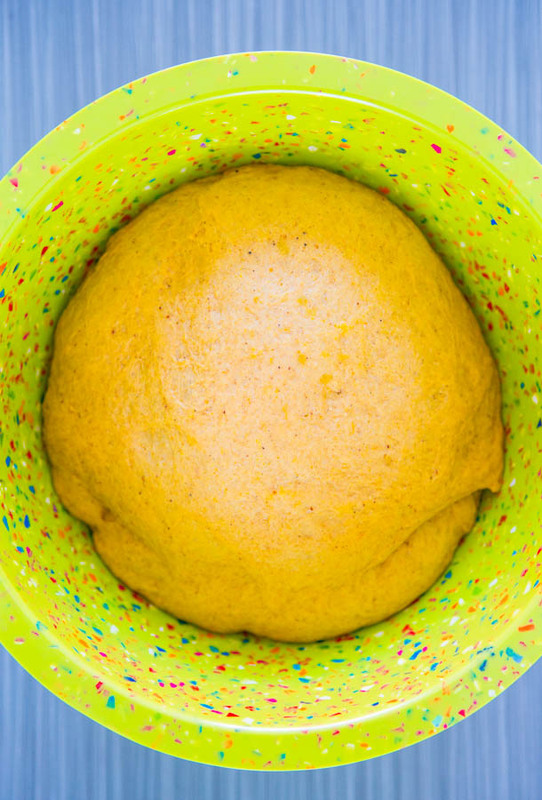 Punch dough down and turn it out onto a nonstick surface. I spray my counter with cooking spray and don’t even need to add flour. Divide dough into 8 to 12 equally-sized portions, rolling each portion into a ball. I made 8 rolls and they were very generously sized. I would aim for 9 to 10 rolls. They may look skimp now but don’t worry, they rise and swell very nicely. 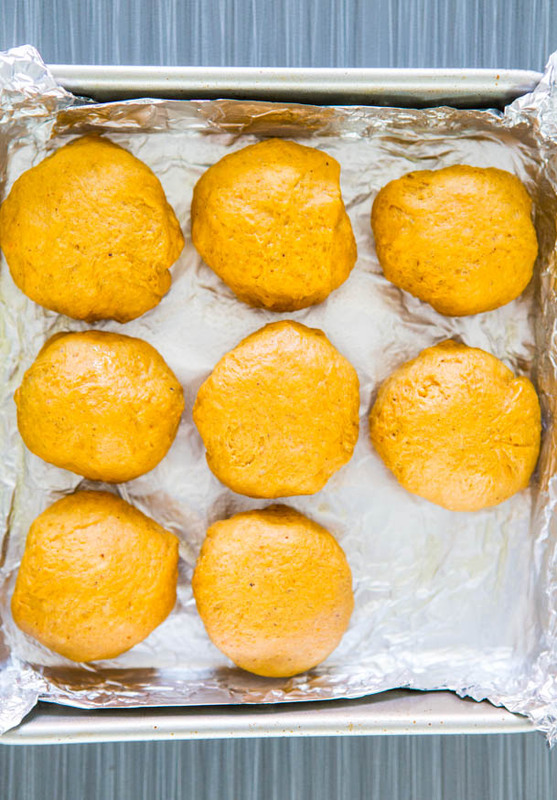 Place dough balls into a foil-lined and cooking sprayed 9-inch square pan. If you would like to use an overnight or make-ahead option, after you get the rolls into the pan and covered with foil, place pan in fridge. 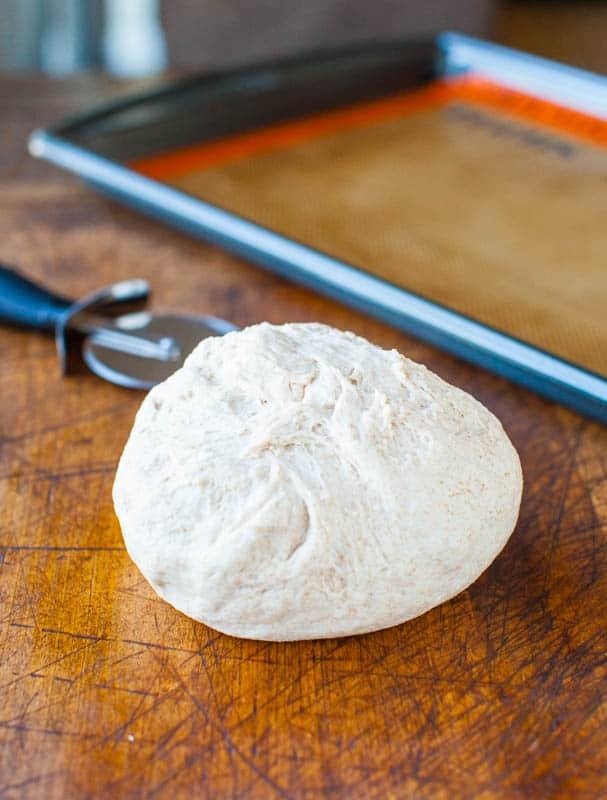 When ready to bake, pick up with the next step below, making sure to allow the dough to come to room temp and rise nicely; it could take longer than the 45 minutes indicated below since dough is coming right out of a cold fridge. Cover pan with a sheet of foil, place pan in a warm, draft-free environment until dough has nearly doubled in bulk, about 45 minutes. In the last minutes of rising, preheat oven to 375F. 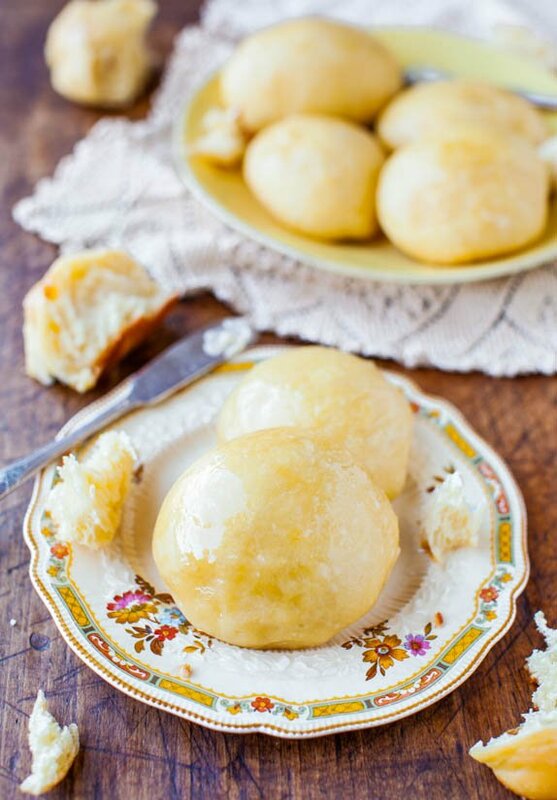 Honey Butter – Melt butter in small microwave-safe bowl, about 45 seconds on high power. Add the honey and stir to combine. Bake for 15 to 17 minutes, or until puffed, golden, domed, cooked through, and when tapped, the rolls should sound hollow. 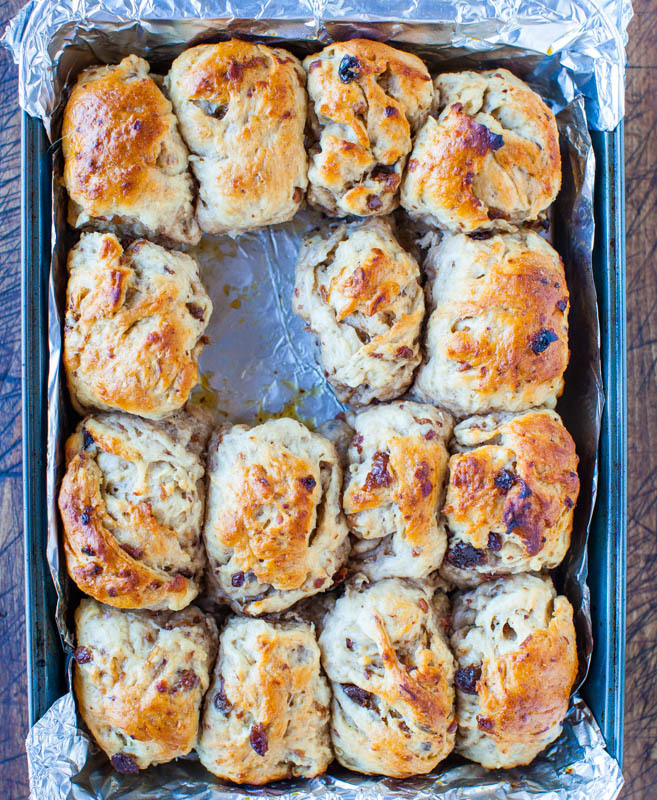 Allow rolls to cool in pan until they’re cool enough to handle before serving. Rolls will keep airtight at room temperature for up to 4 days. Heat in microwave for 5 to 10 seconds as necessary to recreate the just-baked taste and to soften. Finished (baked) rolls will keep airtight in the freezer for up to 6 months. I have not tried freezing this dough in the unbaked state but you could likely freeze it after step 12 and upon thawing, pick up with step 13; however I haven’t tried. Nor have I tried doubling the recipe, but I imagine that would be fine. Bake in a 9×13 pan or similar. 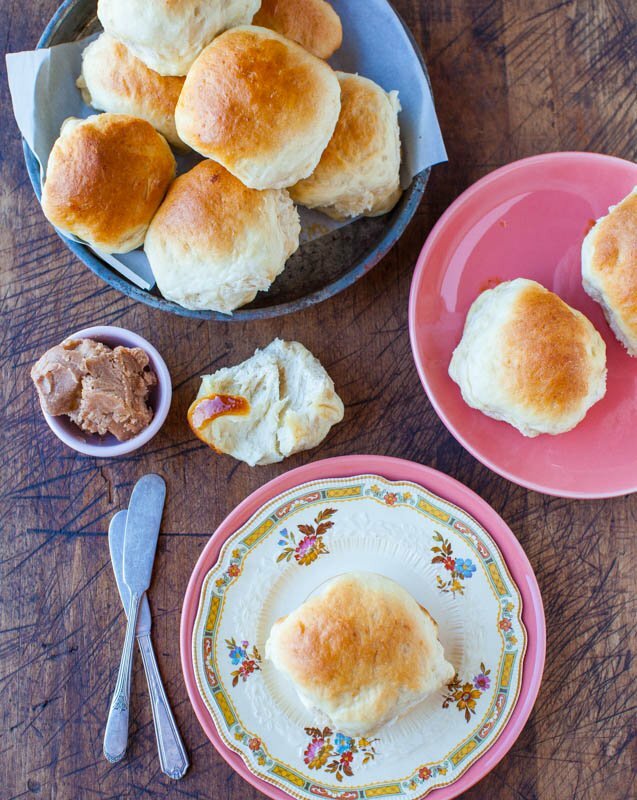 What’s your favorite dinner roll or bread recipe? I would love to make these. Can I use gluten free flour? I have Celiac disease. These look like they would be awesome any night of the week. Since GF flour has no gluten, a key component in helping dough rise, this recipe would not likely work with GF flour. Now, there are GF flours and GF bread recipes that DO work, but I am not an expert on GF flour + yeasted bread baking. 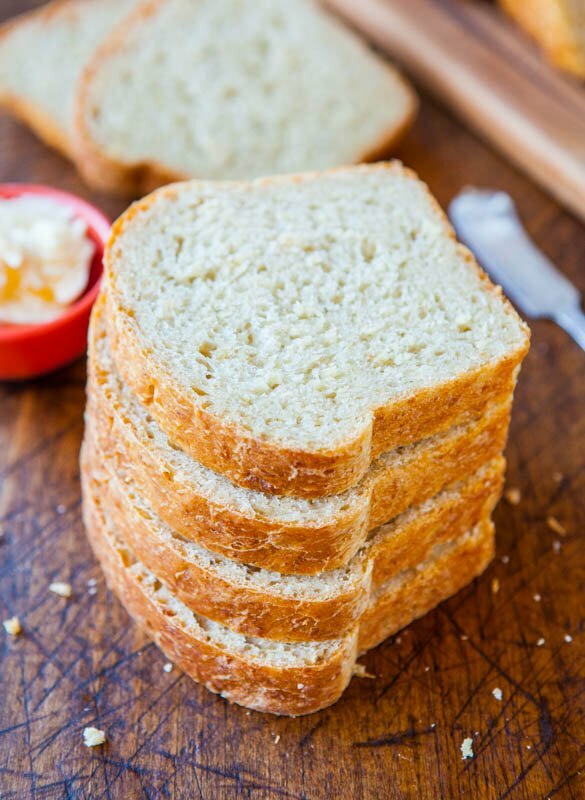 It’s very specialized and ‘picky’ and you have to get everything just right or recipes tend to fail, which is why most people complain about GF bread not tasting right. It’s hard to perfect! My husband brought some beautiful pumpkin home from the farmer’s market so I roasted and pureed it for this. We loved these so much, we ate two rolls each with dinner tonight! I already told my mom about them because I want to add them to the Thanksgiving table this year. My husband is lactose intolerant so we drink almond milk instead of cow milk – it worked just fine in this recipe. I was reading some other comments – I get frustrated with halving recipes for our small family, too. Sometimes I just make a big batch and freeze. Other times, when I really only want a small batch and it calls for an odd number of eggs (like 3), I’ll separate one egg and use only the white or only the yolk and save the other half of the egg for breakfast or another recipe. Hope that makes sense. It’s not a perfect solution, but it has worked ok for me. To Erika and anyone else who wanted to try these gf: tried them today and they were a miserable fail! Didn’t rise at all and didn’t turn out fluffy. I’m sure with gluten they would have been delicious, but sadly not a recipe that translates well with gluten free flour. 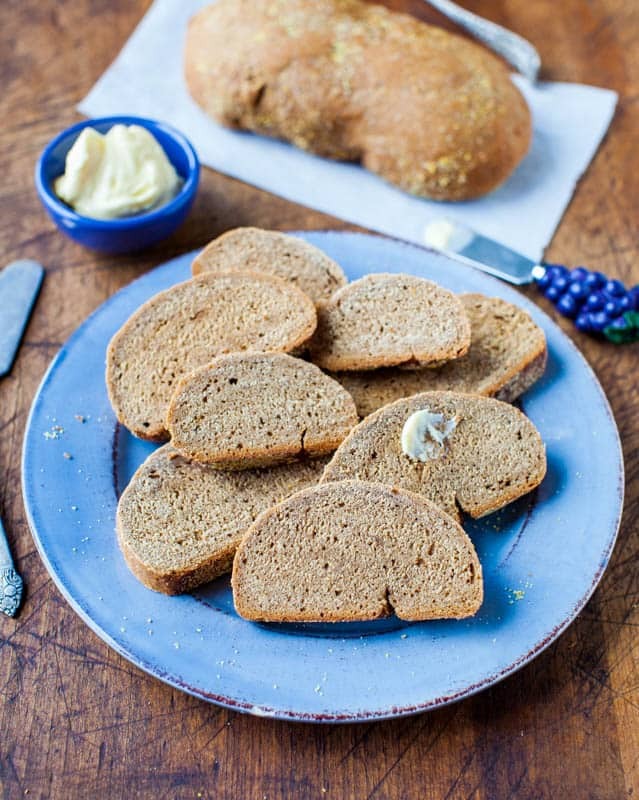 There’s ZERO available gluten in GF flour and this recipe absolutely needs gluten to work. I would not have advised you even bothered trying with a GF flour blend. In order to bake yeast-based items using GF flours, you need to make tons of alterations and generally use all kinds of specialty flours and specialty ingredients. There are entire books, websites, etc. devoted to just this topic b/c it’s quite tricky. But simply swapping GF flour for regular in a recipe like this, nope, won’t ever work. I was excited to find this recipe. My excitement turned to disappointment when tasting them. The rolls themselves don’t have a lot of sweetness. In fact, I thought they tasted pretty horrid if I didn’t get any honey butter in the bite. To infuse more flavor, I would have liked for the honey to be added into the dough rather than slathered on top. When working with yeast in general, if you add too much honey or sugar to dough, it will kill the yeast. They need some sugar to activate and therefore help the dough to rise, but too much and you kill the yeast. It can be a delicate balance. I found that this was the maximum amount of honey I could add into the dough before it became either too wet, too sloppy, or didn’t work. Oh wow, this is awesome. Love comments like these, love that my instructions and step shots helped you overcome your fear of yeast and that you want to make more stuff now! That is wonderful and makes all those pics and typing on my end worth it :) I am so glad you’re happy and you have a whole new baking world ahead of you now! Glad you and your daughter loved the rolls! I plan to make these for Thanksgiving so I practiced last weekend. Always intimidated using yeast! Your step-by-step instructions were perfect. So easy. Surprisingly, I did have to use a bit more flour because my dough was tacky, but only 2T if I correctly recall. They came out so delicious. I know there won’t be leftovers at Thanksgiving, but we had a few left this weekend so I stored in an airtight container. When we went to eat them the next day, they were really damp/moist on top (presumably due to the honey/butter). I’m afraid had I let them go one more day they would’ve gotten moldy. Are you just using a regular airtight container and then letting the container sit on counter? Or do you store them in the fridge? Thanks again for the lovely recipe! 2 tbsp of extra flour is nothing in a big batch of rolls! Glad my step shots and details helped you get over your yeast fears! I don’t store them in the fridge (I never store bread in the fridge!) and possibly because of the honey butter they became extra moist for you on top…maybe scale it back slightly or after baking, just add it to the ones you know you’re having, then as you eat the rest over the next few days, apply it as necessary. i doubled the recipe and it was beautiful !!! Can’t hardly wait for dinner!!! Glad to hear they came out great and glad you doubled it! Hope dinner was a great one! If you’re doubling a recipe, you have to double every ingredient listed. I made these with a roast chicken and they were OUTSTANDING! very good when also slathered with homemade apple butter for breakfast. I had a few leftover so I made them into croutons too! thank you for the wonderful recipe! very good when also slathered with homemade apple butter for breakfast. 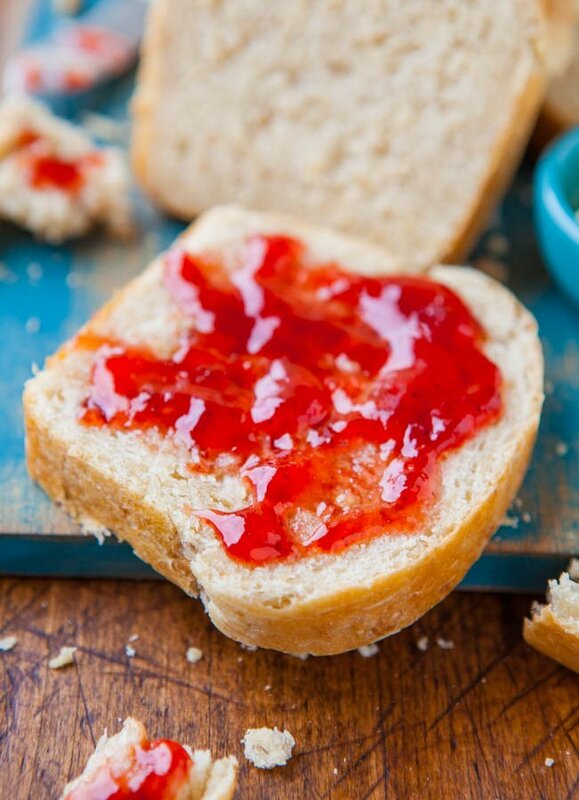 <--- I think almost anything would be amazing with homemade apple butter on it! :) And glad you loved these rolls and that you even were able to use the leftovers for croutons! Is there a link where I can sign up to follow you by email? I am very hopeful about this possibility. Wonder if this dough would freeze well? Also, would doubling it mean also doubling the amount of yeast? These look yummy! Cannot wait to try! I know that you can make the rolls from start to finish, THEN freeze them, and thaw the rolls as you need them; warm in a very low oven or a quick few seconds in the micro if you want them warm. But I haven’t tried freezing this dough in the unbaked state. LMK if you do! I tried out the recipe today & made them gluten free they were amazing! Thank you for the recipe! I used cup4cup gluten free flour & coconut almond milk. They were not hollow but moist and fluffy! Thanks for trying the recipe and I’m glad it came out great for you! I am SUPER IMPRESSED that they worked with Cup4Cup and were still moist and fluffy! Great to know! And I bet the coconut almond milk is a nice touch with the honey butter! These look delicious! Do you think I could sub margarine and almond milk to make them dairy-free? My family doesn’t mix milk and meat and I’d love to make these for thanksgiving! I didn’t have pumpkin spice or nutmeg I added some cinnamon and mixed dried herbs it came out perfect. That’s great and glad they came out perfectly! Curious about what dried herbs you used. I’m worried that the rolls will be to pie-like in taste due to the pumpkin pie seasoning. I was thinking about sage and/or thyme. Thoughts? They’re not overly pumpkin-ey at all but if you want to mask any pumpkin flavor (but then what’s the point…) you could always add whatever other dried herbs you want. Sage/thyme are very overpowering and will mask just about anything IMO. I think the sage and rosemary suggestions sounds amazing. Averie, I think you misunderstood the question: She did not want to mask the pumpkin flavor, but add some nice savory herbs rather than pumpkin pie spice, which would make me nervous as well. I didn’t actually misunderstand – they are pumpkin dinner rolls which is why I use pumpkin pie spice. The other herbs sound lovely but that’s not what I would call a pumpkin dinner roll at that point. It’s more of a ‘fall-flavored dinner roll’. Let me know if you try it. 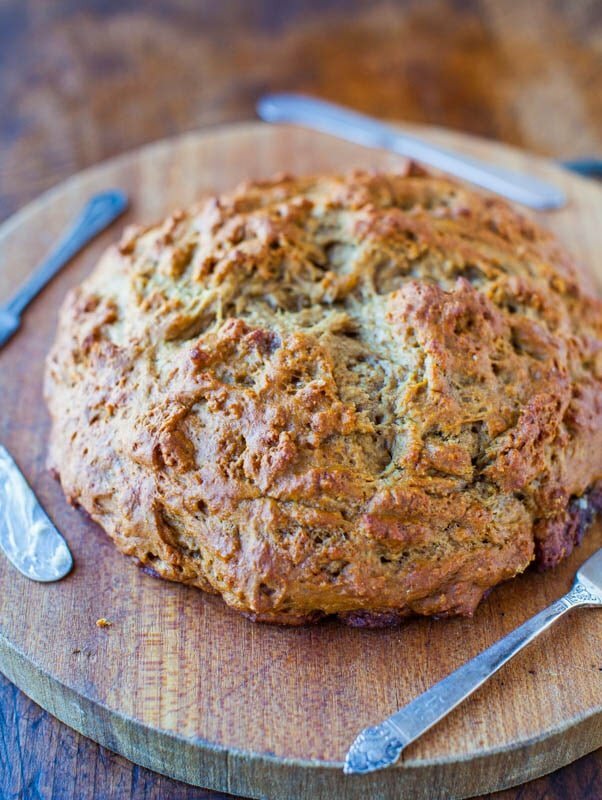 Lovely blog Averie, should I dare to make this with milk and butter substitutes for my allergic-to-dairy husband? Would you recommend against it? I think you’d be able to use a soy, almond, or cashewmilk without much problem. Then there’s the butter…maybe Earth Balance would work? Andt then there’s the egg. That is something that I don’t know how you’d work around in this situation if you have to remove that too. LMK if you end up trying and how things go! might I suggest coconut oil to replace butter for dairy allergies? Eggs are not dairy, they are only an issue for vegans. I have a stupid question – do you buy pumpkin puree? If not, do I just puree raw pumpkin or do I need to cook it first and then puree it? Thanks!! Not stupid at all! I just use Libby‘s pumpkin purée and I can. Enjoy the rolls! Very nice recipe!! I had cooked down about 10 free pie pumpkins,so I felt like Bubba and his shrimp, coming up with pureed pumpkin recipes! Made for Thanksgiving but did a 4x between 2 mixers. Oven could’t keep up so some overproofed but the flavor is there for sure. 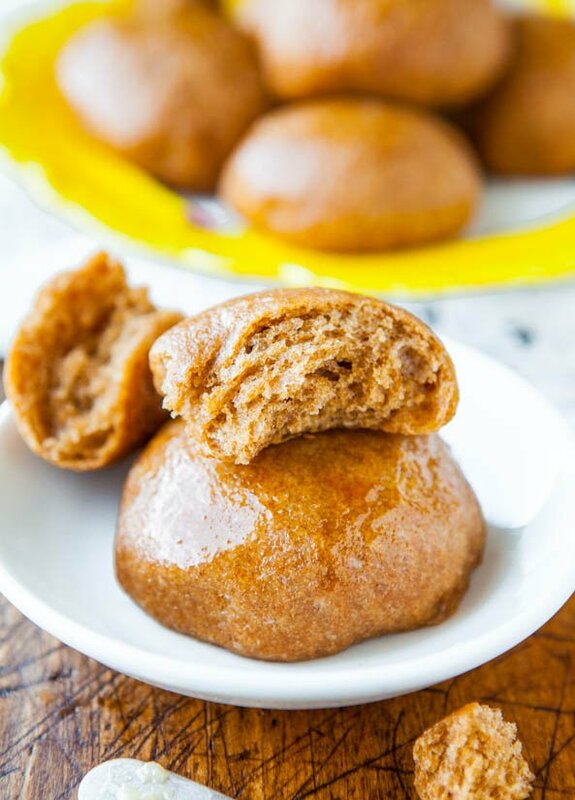 Love that it’s not a sweet roll…a delicious bite while drinking sweeter apple cider sangria with the meal! literally making a single batch right now. Cold rainy day snack…. Thanks for sharing a new go- to for me! Glad you loved the rolls and I agree, not too sweet, and glad you were able to make use of all your pureed pumpkin! Is this a recipe that you could make without a stand mixer? It sounds delicious, however, I don’t own one of those as of yet. You could I suppose, it will just require a lot more elbow grease doing it by hand. 4 years running and I still make YOUR honey pumpkin yeast rolls EVERY year at the holidays!! At least 3-4 dozen for all of our Thansgiving gatherings because they are perfect unique and WONDERFUL in every way. Thanks for the 5 star review and I am glad that you make these every year!